Seven articles published in the magazines “Nature”, “Nature Astronomy”, “Nature Geoscience” and “Nature Communications” (all paywalled but the one on “Nature Communications”) report a series of research results about asteroid Bennu. Hundreds of scientists used data gathered by NASA’s OSIRIS-REx space probe to study in particular various aspects of Bennu’s geology. The results will be useful in various other studies, from those about the origin of life’s building blocks that sowed the Earth to those about the solar system’s formation, including some practical ones such as the search for an area on which OSIRIS-REx can descend to take samples to assessments of the danger posed by asteroids such as Bennu. The OSIRIS-REx (Origins, Spectral Interpretation, Resource Identification, and Security-Regolith Explorer) space probe reached asteroid Bennu, formally 101955 Bennu, on December 2, 2018 and began to closely study what’s considered a primitive object similar to the ones that brought water and organic materials to Earth. Indeed, one of the first results is the confirmation of an abundant presence of hydrated minerals but surprises also arrived with the discovery of plumes of particles that are emitted from the surface and the presence of a lot of rocks of various sizes on the surface. Among the assessments carried out there are those concerning the origin of Bennu. The age of this asteroid still has a rough estimate, between 100 million and one billion years, in any case higher than expected. Probably it formed in the asteroid belt between Mars and Jupiter, where there are complex gravitational interactions but also collisions that can in some cases push an asteroid or pieces of a larger asteroid into the inner solar system. Currently Bennu’s orbit is close to the Earth’s. Scientists already expected Bennu to be made up of smaller rocks, fragments of a larger asteroid that was destroyed by an impact, scattering rocks of which a part coalesced again, albeit in a way that’s far from homogeneous. Many large rocks, which include some boulders larger than 40 meters, rested on Bennu’s surface. These are boulders too large to be produced by impacts since an impact capable of generating such an amount of debris would have destroyed Bennu, while it makes sense that they’re fragments of the parent asteroid, which in fact got destroyed following an impact. However, the analysis of the materials that make up asteroid Bennu indicate that they’re more heterogeneous than expected. There are some regions on its surface that are very dark, almost black, while other regions are very bright and are associated with boulders that are some meters across. One of the compounds detected is magnetite, a mineral that’s formed by the oxidation of iron hydroxide in the presence of water. Together with the abundant presence of hydrated silicates, other minerals that got significantly altered in the presence of liquid water, is an indication of the presence of water at least in the parent asteroid. Spectroscopic analyzes showed similarities between Bennu and meteorites containing very rare carbonaceous chondrites in which carbon and organic compounds are abundant. This is one of the topics related to the study of the origin of life’s building blocks on Earth given that it confirms the presence in asteroids of precursors of molecules that are important in life’s origin. It’s not yet clear how many of those compounds and how much water arrived on Earth from asteroids and how many from comets, other celestial bodies where organic compounds were found. The effects of the uneven solar emissions hitting asteroid Bennu way were measured, indicating an increase in its rotation speed. This is the YORP (Yarkovsky-O’Keefe-Radzievskii-Paddack) effect, previously confirmed in the study of other asteroids. Bennu’s rotation period is decreasing by one second every hundred years, little but it can be significant for an asteroid where there’s a delicate balance between its gravity and the centrifugal force generated by its rotation. 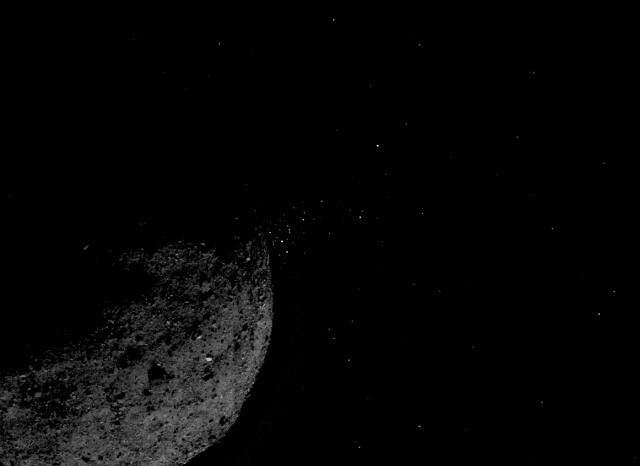 If Bennu spinned much more quickly, losing materials might become easier. The emission of plumes, visible in the bottom image (NASA/Goddard/University of Arizona/Lockheed Martin), from the surface of asteroid Bennu was another surprise, to the point that the principal investigator of the OSIRIS-REx mission Dante Lauretta called it one of the greatest of his career. There was speculation that Bennu might have some activity but nothing was detected from Earth. The process leading to particle emission isn’t clear and this will be one of the topics of researchers’ investigations. The emissions and even more the surface full of rocks will be a problem for the sampling operations. There’s still more than a year for the needed assessments given that sampling is scheduled to be carried out in July 2020. In the meantime a global map was published, visible in the top image (NASA/Goddard/University of Arizona), created by putting together images captured by the OSIRIS-REx space probe’s OCAMS (PolyCam) instrument. Research on Bennu has just begun and has already shown surprises, which may be useful for the various studies that are the ultimate goal of the mission of revealing some secrets of the solar system’s history and perhaps the Earth’s history as well.